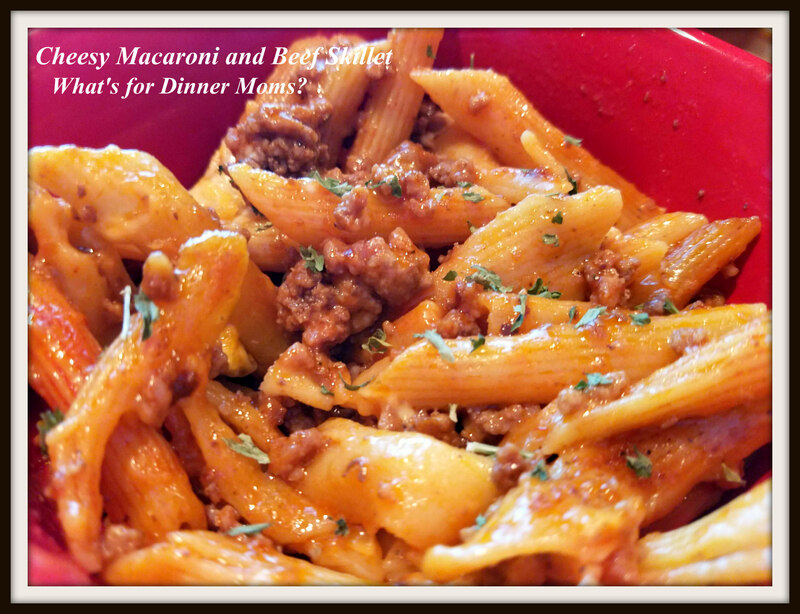 Cheesy Macaroni and Beef Skillet – What's for Dinner Moms? I love the meals where you cook everything in one pan. 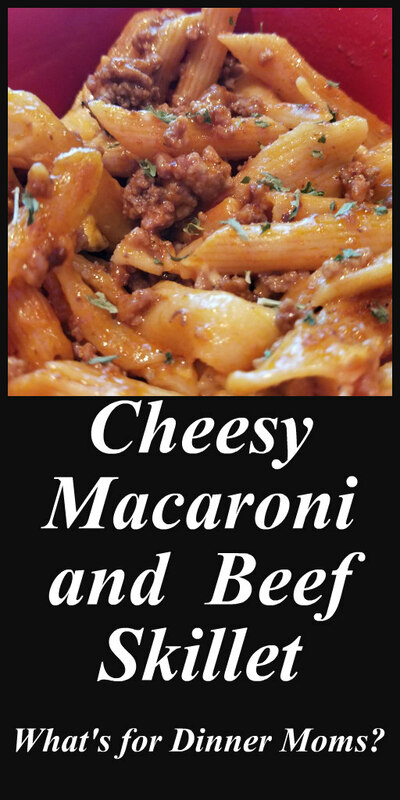 The beef and pasta cook all together so the pasta is infused with tons of flavor from the spices and beef stock. I am not a huge pasta fan but when it is cooked like this I love it! You need to remember to stir the pasta during cooking otherwise your pasta may cook unevenly (I had a few tough pieces in my dish, oops). But, everyone loved this dish. It was simple with lots of flavor. Add a simple side salad and a green vegetable and your meal is complete. I love simple one skillet dinners with tons of flavor! In a large skillet or pan brown the ground beef and onion over medium-high heat breaking the beef up into small pieces as it cooks. Drain any grease from pan after cooking. Mix seasoning, tomato paste, pasta, and beef stock into the meat. Cover and allow pan to come to a simmer. Turn the heat down and allow pasta to cook for 7-9 minutes until desired texture is reached. Stir often to ensure that pasta is cooked evenly. Uncover pan and allow any extra moisture to cook off for a minute or two if needed. Stir in 1/2 of cheeses. Continue to stir until cheese melts. Place rest of cheese on top and cover for a few minutes until cheese melts. Remove pan from heat and serve with extra cheese over the top as desired. This sounds really wonderful and the pasta cooking in with everything would be amazing! Thanks, Lynn! I find that I like boxed pasta cooked in something other than water better. Stock or sauces work great. Yes it makes all the difference! Will try this one next week. I tried the cheesy stuffing chicken one and the kids loved it! Hope you like it! Just FYI- you can easily shred a block of mozzarella with a box grater. Pre-shredded cheese is coated so that it doesn’t stick together in the package. It doesn’t have quite the same flavor as a block of cheese you shred at home but is fine for a time saver. Ohhhhh ! ! Hah ! Thank you for the tip ! ! ! My kids would love this, but for some reason, I just can’t stomach any kind of pasta with hamburger meat. It does look good, though! You can use Italian sausage too. Or leave out the meat! Never thought of using Italian sausage, that just might work! Thanks!! !